I have a buddy that buys damaged boats thru coparts. He has different trades make repairs and he sells them ince fixed up. He is saving buyers 15-30 grand and is making 10 grand or better. Not a bad gig. Hard to justify new boat prices for the working man these days. I can't wait. I saw where you had posted in another thread in this section. Was thinking you said you all were brothers? Didn't realize you were a guide there or I would have booked with you. Each post you were recommending Baz so I guess I thought you were a guide somewhere else. How is the fishing now? What do you think we will be targeting? He said the tide chart shows the best day being the day we are booked. Any suggestions on things to do? This is our third year in Pcola Beach. Staying on Ariola a few steps from the Gulf. We typically just sit around the pool, dock or beach. Always load up at Joe Pattie's and fix seafood all week. We usually eat out some. If we have a late night return from a game, we will eat on the way back in to the house. Would love to find some great local places. Always do Peg Leg Petes. We ate at Shaggy's while waiting on our rental to open up last year. Great blackened grouper tacos. The guide I fished with last year said Frisky Dolphin had the best grouper on the island. We did Flounder's one night. Was on Friday and they had a great band in there. Food was decent but people dropping everywhere and throwing up in the restrooms. Thought the food trucks/Airstreams in Pcola near Joe Patti's looked cool. May check those out for lunch. If you are in the area, we should try to connect. Thinking about doing a Low Country Boil on Sunday. Would be a good day to come hang out and eat. Foodie... Options for leftover shrimp/crawfish boil? I found the info from the chowder. Thought I'd share here. Was super simple. I had texted a buddy pics of the cook last year while we were both on Spring Break in different states. He said his assistants had a great recipe for the leftovers and he texted me what she had texted him. Take the leftovers from the boil and cut all of the solids up into bitesize pieces. In a large pot, heat up some of the stock from the boil (can use chicken broth or other broth/stock as desired). Add Heavy Cream to desired color, texture, taste. Add in the solids from the boil. Add corn and sausage if needed. Add creole seasoning to taste. Simmer for 20-30 min. This was a fantastic chowder. Could use Crawfish, Crab meat or about any fish leftovers for a seafood chowder. The flavors leftover from the crawfish boil in the stock and veggies/meat were amazing. Paired with any cold beer or 6, you will be a happy camper. Will be doing a large shrimp boil next week. Looking for a chowder, stew, soup, etc to use the ingredients in without having to get much more to complete the dish. Last year I found some kind of chowder recipe that was fantastic but with lots of "spirits" involved, I don't remember much about putting it together or where the recipe is. Does anyone have a good recipe for using the leftover ingredients that they'd be willing to share? I'm pretty sure we did something like a shrimp and corn chowder. Didn't need to add much spice or anything. Just some heavy cream, stock and the leftovers. SCE4R19PLC200 12207-005-001-001 I don't have any major issues with this prop. It isn't perfect but it gets the boat running and doesn't have a horrible time with porpoising. The prop appears design to mitigate some of the issues related to the 2000v model. One thing I still have an issue with that kind of drives me nuts is making sharp turns. The prop tends to blow out (lose grip) but that isn't a prop issue. I think it is an issue with how the trim tabs are mounted to the back of the boat. Something is creating aerated water causing the prop to just spin. Only thing we can come up with is the tabs. As far as performance, I can run in the 40s if I'm loaded to the tilt. If a few people with minimum gear I can top 50. Don't like it. I'm happy at cruising 35 and can do that loaded or not without any issues. Since the route is linked above, I'll post a pic to save a few clicks. I'm running an 06 Pathy 2000v. Power Tech 4 blade (not sure on pitch) and wound't think of getting less than a 36v after upgrading from a 24v. Many reasons this is a better setup for me. I fish heavy cover in some lakes and I can pull right through the grass and pads with ease and can do it all day. It will wear out a 24v battery down much quicker. In the salt, it will hold in some swift currents where the 24 could be pushed around a bit and it burns up some battery there as well. And 60" for me so I can fight the big rollers without blowing the prop out of the water. What kind of cameras are you guys using? Are they portable where you can set up at home and take with you on trips for using at a Hotel or rental? I like the thought of a trail cam that shoots the photos to you but have heard of IP cameras kind of the same but alert you to movement and then you can click on the video. I'm not far away from putting up cameras at my office and home. Just got to find the right equipment and setup. So I ended up going with Safeco. That is thru my local agent. Figured i would try to keep the business local so as to hopefully help My local business. My agreed value on the 06 Pathfinder 2000v is 28,000.00 ($500 ded). I’ve got about $5k in personal/fishing items ($250 ded). 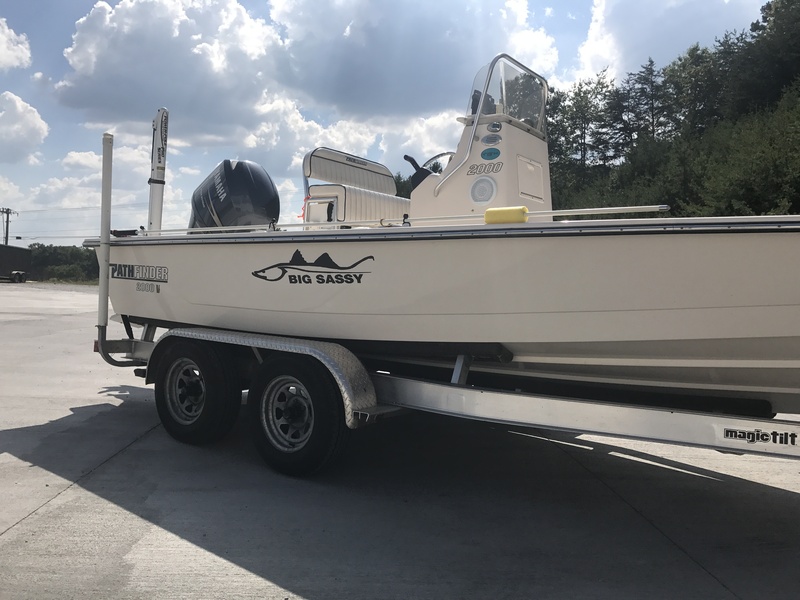 Up to $2,000 for tow of boat or trailer. $500k/$300k/$200k. Premium is $346. $312 if pay in full by renewal date. I talked to State Farm (over $400), Progressive ($340ish) and Boat Us/Geiko ($320). Would have gone with Boat US because the price for their tow membership with unlimited miles/price was only about $80. Sea Tow will run me about $170.